A message for all Chicago-area bats (the flying kind): There’s plenty of room at the inn. 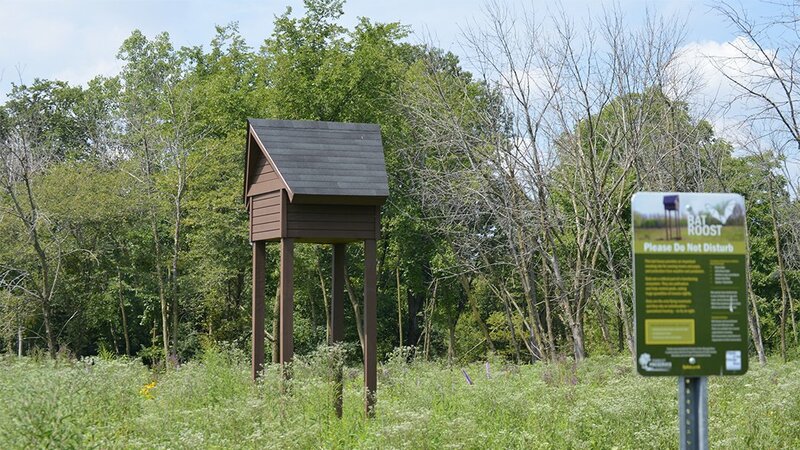 Staff from two area organizations have installed a sixth “bat condo” in Cook County as part of a multiyear effort to increase populations of certain bat species that have declined as a result of habitat loss caused by invasive plants. On Aug. 1, staff from the nonprofit Friends of the Chicago River and the Forest Preserve District of Cook County used a crane to set in place a new bat shelter near Thorn Creek at Joe Orr Woods in Chicago Heights. Of the 13 bat species found in Illinois, Frisbie said seven are “colony nesters” that rely on heat in order to roost and care for their pups. The bat houses are located near waterways belonging to the Chicago River system in Cook County. The bat houses started going up in 2015 but remain empty to date. Just why are these bat colonies so important? The bats most commonly found in the Chicago area, big brown and little brown bats, have especially big appetites for insects: One half-ounce little brown bat can eat half its body weight in bugs each night, according to Friends. Because bats also avoid contact with humans, they provide a more natural option for mosquito abatement, Frisbie said. “The idea of having these big, giant maternity colonies is really a game-changer,” Frisbie said previously.